You are here: Home » Can I Marry Him (or Her)?, Islamic Answers 2010, Marriage, Religion, Want to Get Married » Can I marry my cousin’s daughter? Abortion – Do or Don’t? Can I marry my cousin’s daughter? My name is Ahmed and I would like to know if I can marry my cousin's (Suleiman) daughter. My father and my cousin's father were brothers. So we are first grade cousins. Is it allowed in Islam to marry my niece? I have read the story of Fatima and Ali, and they had the same linkage and Allah approved the marriage and they had healthy sons. Yes, you can marry your cousin's daughter. In Islam is is forbidden to marry a niece. Your niece would be the daughter of your brother or sister. However, your cousin's daughter is not truly your niece. She is not a mahrem to you, and not one of the prohibited categories mentioned for marriage in the Quran. As you pointed out, Ali and Fatima (may Allah be pleased with them) had the same relationship, and were married. "The daughters of your paternal uncles and aunts are permissible for you to marry, and so are their daughters, no matter how far the line of descent extends. And the daughters of your maternal uncles and aunts are also permissible for you to marry, and so are their daughters. Perhaps you are confused because it is customary for such girls to call you uncle, but this is just a custom, and it does not mean that it is haraam to marry them." shafique, I do not speak Urdu. Please read the comments already given on this page, as I have answered the same question over and over again. Assalaimu alaikum, pls can i married my father elder brother daughter she senior me 4 years? It is allowed to marry your first cousin, though I do not advise it for health reasons. It's a big world, Aliyu. Look beyond your own family members for a partner. hi im Sufiaan and i love my mother`s brother`s daughter, is it permitted in islam to marry her. assalamualikum wa rehmatullahi wa barkaatuhu .. I like my mother's cousin...who is my uncle but we both are of the same age and we have grown up together. Is is allowed! I know in my mind it says its wrong but i cant help it ..i cant control my feelings! is it allowed in our religion?? Sabrina, he's not really your uncle, and you can marry him. It's strikes me as rather strange, but it's technically allowed. And by the way, though you may not be able to control your feelings, you can control your actions. Sabrina, all I said is that it's Islamically permissible to marry him. As I said, I still think it's a little odd. And I do not know what the other Islamic website said to you or why. If you are involved in any kind of relationship with him outside of marriage, then that would be haram. If it is islamically permisible then how the hell can you say it looks odd? Please log in and submit your question as a new post. If you search the site, you will most probably find a similar questioned already answered. My question to you is can i marry my mother's maternal uncle's daughter ? Yes. You are asking about marrying your mother's cousin. It seems strange to me, and it may not be a good idea genetically, but there is no prohibition. is it permissible to marry her? Matin, it's true that first cousin marriages have a higher probability of producing children with birth defects, including mental retardation. It's always healthier to marry outside the family. What is wrong with you all? Control yourselves. These people are family, there is a whole wide world of people out there. If you like someone in your family, enjoy their company in a normal way, like as a friend, brother or sister , cousin nothing more. It truly is strange. I have experienced this first hand - my husband of 35 years has dumped me and his children because he thinks he loves his cousin's daughter, someone he hasn't seen or talked to for 40 years just because they played together as children and he is having a mid life crisis. Pathetic! I understand the connection as someone to cherish and enjoy their company because you have things in common, but how misguided can you get, you don't marry your own family. And in my case, dump us all and pretend the last 35 years didn't really exist. It's called the second male puberty, men think they are 15 again! Sick! Get a life all of you! It makes for bad blood! Eli, I understand you are bitter over your situation, but you can make your point without insulting people. I think your missing the point, the problem isnt really marrying the cousin but your anger is vented that way because your husband left you and married his cousin, now had your husband left you and married another women, would it make it any better for you ? 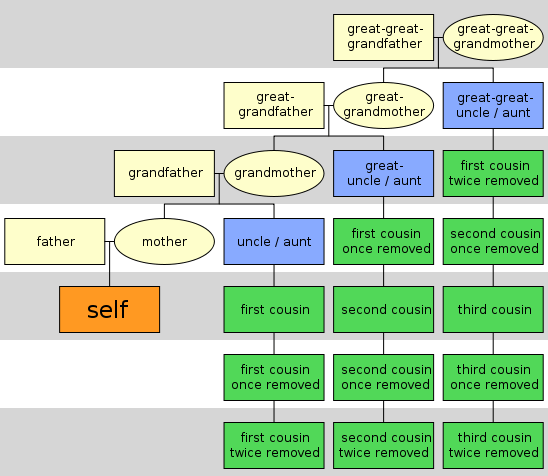 In terms of family and marrying cousins, well they are not immediate family and you must remember we are all descendants of adam and eve, so in all of us 1 blood cell is the same as everyone in the world, but we evolved so in which case we are all family in one way and should we never marry then ?. since the cousin is permissible by Allah, if we feel attracted then why should we hold back because of moral values of some people, in the case of food, if something is halal and you really want it, yet a few people say well maybe you should leave it because it seems wrong or bad, are you seriously going to leave that food because of them, of course not if Allah made it halal, who the hell cares what the rest say, morals are social guidline on how to live life, yet the law of Allah is greater, in which case there is nothing wrong with cousin marriages. Despite this it all depends on the relationship one has with their cousins, in modern world the relations with cousins are like friends, i personally can relate to that, so in this case its hard to marry because you have to change how you think of them, but in more traditional families the contact is limited and more distant, hence the idea of marriage is rather appealing, and this is why you have so many asian cousin marriages in todays world. I have sympathy for you, your situation is a tough one and at the age of your husband, it was a bit stupid and he should have been more responsible, but my above reply was more aimed at younger people, and so you have right to accuse your husband, but the cousin tradition is still ever present among the communities, and only in modern families do cousin marriages not fall to be the first port of call. So I didn't need to tell you all that ..
search it for yourself, outside the realms of Islam and see what ordinary people say .. acceptance of cousin relationship/marriage is in the minority .. and having four wives in Western society is not allowed anywhere .. other than moslem countries. Unfortunately, I am still married to my husband ...and on top of him being with his cousin, he thinks he can take her as his wife whilst living in a western country ... he is away with the fairies .. Sister, i myself am from a western society and understand your point and cousin marriages are considered wrong by many people. but their are still people who follow the traditional method, its just with me being a speaker, im used to putting my thoughts to a side and focussing on the religious issue, but i totally understand and agree with your point about the modern western society and its non-accpetance of cousin marriages and or 4 wifes. But personally i feel your husband is a bit of a wimp or beg(forgive me for my words but i dislike men with such weakness), i disagree with what he did to you, at his age he should know better than to pursue a girl who has turned him down twice, i mean self respect tells man to not go back to something that turned him down, especially twice, and the fact that he has children and a loving wife in you, well i believe in attractiveness and youth, but i would never leave my wife for someone younger because attactivness and youth of the heart matters not the body, i guess your husband never really appreciated your love and respect for him. Sister may Allah guide you and your children, may you stay on the straight path and may you cope with your husbands insensitive choices insha'Allah. I so appreciate your kind words in my moment of need .. I was beginning to lose faith .. I am becoming stronger because of this experience, but it damn well hurts .. so I ask anyone considering this route to take heed from my experience and fully consider the consequences of their actions before committing. By the way, beauty is in the eye of the beholder and in this instance my husband has said he has put her looks aside (as she is the opposite to me and not attractive or wearing so well for a 53 year old!). The reason he gives is because she says the right thing and she "doesn't care". He is a total idiot as of course they have nothing to share at the moment and no business to run together, like we do and the bills will start to come soon, not to mention her family issues etc. etc. I really believe this means she is playing the game for the visa to western society (especially as she didn't want him before). Well she is here now, God only knows how Immigration let her in on a marriage visa (when we are still married), but I trust in God and Allah to sort this out. Karma has already dealt him two hands and he still dosn't get it. I wish you all well, really I do, but please be careful in your choices and be aware that society does judge your actions and cousin relationships are a very sensitive subject, best not discussed in public too often! Take care and thank you. Plz MY MUSLIM BROTHERS n SISTERS, i want to marry my Sister daughter. Yes, Allah has permitted cousin marriages, providing the two are not milk siblings. Let me add that though it's allowed, it may not be healthy. If first cousin marriage happens rarely it's probably not a big deal. But if it happens frequently within a certain population, it will start to lead to birth defects in the children. One of the worst things is children of a first cousin marriage also marrying their first cousins. It multiplies the chances of birth defects. according to Islamic law. If yes, please answer with Quran/Hadith refferences. Syed, it is permissible. If you want a more detailed answer, then please log in and write your question as a separate post, thank you. as a non muslim i came here to see. I understand Eli better than those who cant differentiate between those we already have as family and the new blood needed for a healthy ancestory. I admit my cousins and uncles/aunts have been nicer to me than the few relationships i have had with outsiders, but i have found my romeo and soul mate away from those who are my blood relatives with the same genetic flaws as myself which would ensure a continuation of genetically flawed offspring when both family members carry the same gene it is 100% the offspring will have that bad gene. My children are not perfect but they have no genetic defects and mental retartdation can go un noticed after generations of subtle changes in a families structure and make up. I mean if all family members for generations have retardation there is no one who can tell the difference between normal and retarded. Not even friends and neighbours outside of family as maybe they have all done the same thing and no one in the entire community can tell the difference between retarded or normal??? Can I marry my mothers, elder brothers daughter? She is your cousin. You are allowed to marry her. javid, yes, you can marry her. She's your cousin's daughter, and is not your mahrem. It is just like saying my son can not marry my sister's daughter. If the question was first wife's daugher marrying the second wife's son, this would be haraam because they come from the same father (relation by paternity). In your case, she is your cousin's daugher and not your mahram, as brother Wael said. Is it haram if i marry my dad's cousin's grandson, which is supposed to be my nephew but he is 3 years older and i really really like him.. I didnt know how we were related until after i had feelings for him. It is not haram. He is not mahrem to you. Can I marry my dad's cousin ??? Any cousin is permissible to marry in Islam. Yes you are allowed to marry her however I think you guys are too young to get married as most likely it's infatuation and none of you really know what marriage entails. Concentrate on your studies you both and once you are more mature and bit settled in your careers then send you parents to ask her hand in marriage. IA things will work out in the best interest of you both by the grace of Allah almighty. assalamualaikum. Me nd my maternal uncle he is my mother's cousin brother like each other is it permitted in islam to marry such relation's? neha, yes it is permitted. is it really permissable!! If is it so then i m really thankfull to u!! I was in a denial since a long time. Thanku very much for providing me best of ur knowledge. If someone is your brother's daughter, how can she not be his own daughter? I'm sorry, I don't quite understand. If she is your niece (your brother's daughter) then you would not be permitted to marry her, as Brother Wael has already said in an earlier comment on this post. Maurice, yes you can marry her. Mohamed, you are asking whether you can marry your first cousin. The answer is yes. Though I personally do not recommend it for health reasons. I just hav one question. can I marry my paternal cousin's son as v Both lyk each other alot nd he is 5yrs elder to me. So is it permissible in ISLAM to marry? 1. Is it true you are not allowed to marry your sister's daughter? 2. Can one marry the Grand-daughter of his sister? You cannot marry your sister's daughter. It is forbidden in Islam and in all societies in fact. As for your sister's granddaughter, as far as I kmow it is allowed, but it seems very strange to me. Wouldn't she be far younger than you? Why this obsession with your own family members? It'so a big world. Broaden your horizons and make a healthier choice. I want to know that is the marriage possible with my Father's niece's daughter... We have the same age.. Cause her mother is elder to me so i call her "Baji(sis)" after her name and her daughter call me "uncle(mamu)" and i don't know anything why she call me "uncle(mamu)" and because of that she becomes my niece.. so is it possible that i can marry her. That is your cousin, and yes you can marry her. Though I do not recommend first cousin marriage as it carries increased chances of birth defects in the children. sir.. can i marry the daughter of my cousin( woman)... they are in my mother side..
For goodness sake, read the answers already given. You are asking exactly the same question as the original poster. I was just wondering for example: is it permissible to get married to my mom's cousin? Yes, you can marry her. Personally, I always advise against cousin marriage for health reasons. But it is permissible. waiting for your valuable reply. Thank you..
Can I marry my grandfather's sister's daughter? Relation-wise she is my aunt (Cousin aunt) or you can say my father's cousin. Please let me know with brief explanation and reasons. MY parents are already..first cousins.. My nani and..dadi are own sisters... and now.. My parents want me to marry my.. frst cousin.. ie... My father's elder sister's. Son.. Is it permissable...in Islam.? Anees, it is permissible but it is a very bad idea from a health standpoint. When you have two successive generations of first cousin marriages, the chances of having children with major birth defects becomes quite high. It is called inbreeding, and it produces serious congenital deformities. Find someone outside your family, please! It is so much healthier. Can i marry my mothers sisters Grandson,We both are of same age..
meher, yes you can, but it is always healthier to marry outside of the family. Thank you so much,I can understand that may be some issues arises if we marry within the family. But we both grown together and we both like each other a lot. As Allah is merciful i hope he will bless us with healthy children. i had posted a query few months query that i can i marry my cousin(He is my mothers elder sisters daughter's son) and in relation i will be aunt for him but he is elder (6 months ) than me and we were friends from childhood and every one in the family knows that, but now we thought of marrying each other and i asked for the same in this website and Mashaallah i got a positive reply. But the thing is we said about our marriage proposal in both of our houses and they were worrying about this relation and they are saying it is not acceptable in Islam and society will not accept it. but i just want to clear all their doubt , So please suggest me in this regards and it would be more helpful if you give me any example. Inshaallah hoping for a positive reply. Can I marry my cousin son? Aisyah, yes, you can marry your cousin's son. I want to marry my father's first cousin. So can I marry my father's first cousin? Is it allow in Islam? Yes, you can marry your father's first cousin. I'm 27 now and my nephew she's 17 now she's daughter of my mother's sisters Grand daughter. means my cousins daughter. (they are 5 children and she's 3rd one ). Salamualaikum,i want to know if its permisable to marry my cousins daughter which to say is my mothers sister daughters daughter?